Brittany's Book Rambles: Summer of Supernovas by Darcy Woods Blog Tour! Young adult author Darcy Woods had three big loves in grade school: Reading, writing, and pizza day. Some things never change. She lives in Michigan with her madly supportive husband, two tuxedo cats (who overdress for everything) and a closet full of neatly organized shoes. Once upon a time, she served in a US Army aviation unit and threw live grenades. Now she throws words. 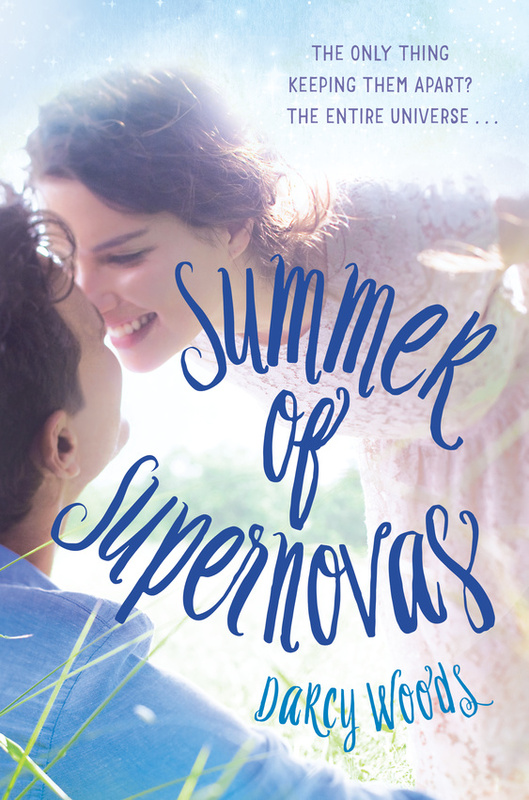 Darcy’s Golden Heart®-winning debut YA romance, SUMMER OF SUPERNOVAS, comes out from Random House/Crown May 10, 2016. 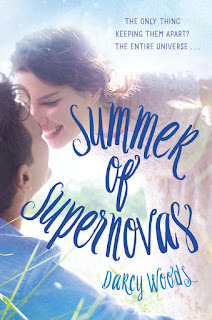 A quick and fluffy read that makes you feel all warm and fuzzy inside, Summer of Supernovas centers around teenage love, as well as how your beliefs can sometimes help you heal, and other times, they can hold you back. The opening scene of this book is probably one of the most hilarious things I've ever read in a YA contemporary, and it really pulled me into the story right away. Although I did find this book to occasionally be predictable or cliché, I was fully prepared for that when I added it to my TBR. Summer of Supernovas is everything it promises to be—an adorable and pleasant novel that's especially great to read when you're feeling bogged down by everyday life. As a whole, I found this book to be really funny. Darcy is a master of taking real life situations that you can relate to and making them hilarious. 2) I already said that the book itself is really funny, but this is especially true for the dialogue. I love all of the banter between the main characters, and the dialogue gives you a real sense of all of their personalities. 1) There are some aspects of the book that I found to be cliche and predictable but I don't want to list them because I was able to overlook them for the most part. Aww! Thank you SO much, Sophie!!! This book comes out on my birthday! Now I have to read it :). Also, it sounds super good. What a great birthday gift! I hope you love it! Sounds like fate to me. ;) Thank you to infinity, Liv! Hope you enjoy Wil's star-fueled adventure!!! 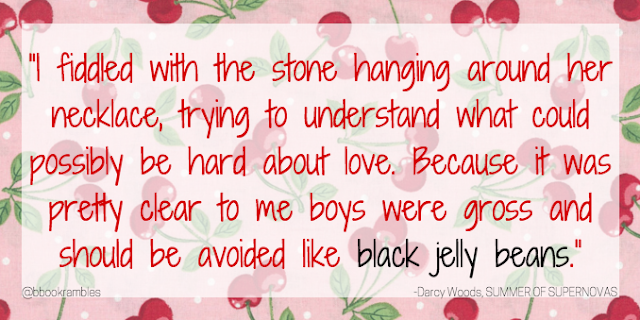 LOL The Black Jelly Beans quote was one of my favorites!! I adored this one too so this makes me happy you liked it, too! Didn't Brittany do an amaze job with the quotes & graphics?! I pet them all daily. :) And THANK YOU, Tonyalee! I am beyond happy you adored!!! That quote makes me laugh so much! I'm so glad you loved this book! 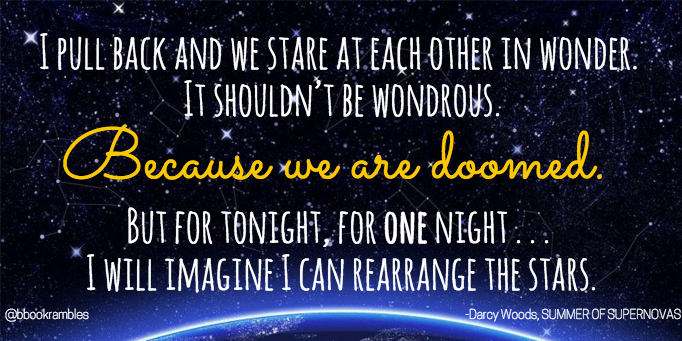 Darcy, you're making me blush! thanks for your fantastic review! I love the first meet story as found on Facebook (failure to do laundry in a timely manner is hilarious!). The voice of this book is emotional, heart-warming, and funny! Thank you for reading it! That first meet moment is hilarious. I still laugh out loud just thinking about it! And I definitely agree about the main character's voice! You're so sweet. Thanks for the cover love, Sarah! And yes, there's no shortage of repartee and humor in these pages. ;) I hope you enjoy! Hmm, astrology, not astronomy? I kind of thought it might be more science-y from the title, but this does sound like a fun read anyway! Great review! Hey Lisa! Yes, this definitely bends toward astrology! And it was really important to me to keep it: A) accessible to anyone whether they knew their Taurus bulls from their Capricorn goats or not. B) Keep it FUN. Such a lovely review and blog tour post Brittany :D Thank you for sharing about this book. <3 It seems so cute. Not for me, but still :D Yay for loving the boy. <3 He seems awesome.